Weather – Page 521 – Welcome to Wyandotte Daily! Scattered thunderstorms may develop this afternoon, mainly after 1 p.m., according to the National Weather Service. While some storms in the region may be capable of producing small hail and lightning, severe weather is not expected, the weather service stated. Today’s high will be 89, and skies will be mostly sunny. The chance of precipitation is 30 percent. The wind is predicted to be 6 to 10 mph. 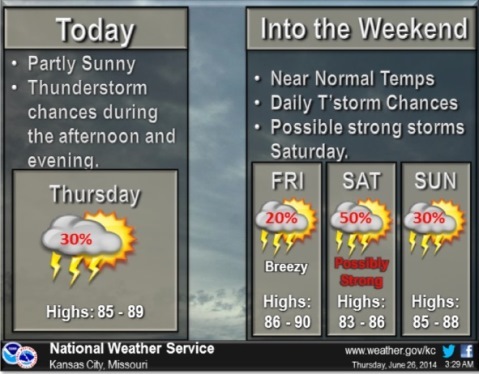 Thunderstorm chances will continue into the weekend and into the beginning of next week, according to the weather service. There is a potential for storms to be severe on Saturday in the region, with the main concerns large hail and damaging winds. 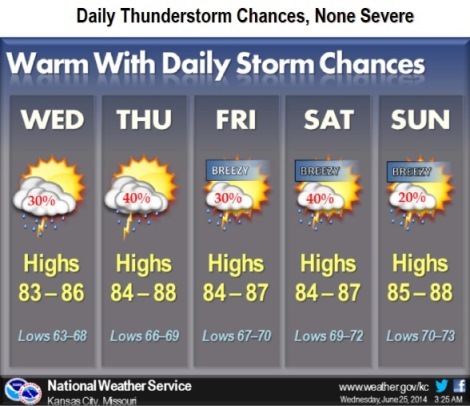 Thunderstorms are in the forecast for the rest of the week, according to the National Weather Service. None of them is expected to be severe. Wednesday’s forecast is a 20 percent chance of showers and storms after 3 p.m. Skies will be partly sunny today, with a high near 85. Wednesday night, there is a 40 percent chance of showers and storms. The low will be 69. Less than a tenth of an inch of rain is expected. On Thursday, expect a 40 percent chance of showers and storms. Most of the day will be mostly sunny with a high near 87. Rainfall amounts may total between a tenth and a quarter of an inch. Thursday night, the forecast is partly cloudy skies with a low of 70. Friday, storms and showers are still in the forecast. A 30 percent chance of rain is predicted. Skies will be mostly sunny most of the day, with a high of 86. Friday night’s forecast is partly cloudy with a low of 72. Saturday’s forecast is partly cloudy with a high near 87. Saturday night, there is a 30 percent chance of rain. Sunday, there is finally a break from rain. The forecast for Sunday is partly sunny with a high of 87. Sunday night, the forecast is partly cloudy and a low of 74. Monday, temperatures start climbing back up to close to the 90s, as a high of 89 and mostly sunny skies are predicted. Monday night, there is a 40 percent chance of showers and thunderstorms. This afternoon’s high will be 85 degrees in mostly sunny skies, with the forecast changing for Wednesday. Tonight, there will be a slight chance of storms. On Wednesday, there is a 50 percent chance of rain and storms, according to the National Weather Service. The high will be 82. Wednesday night, look for a 30 percent chance of precipitation. Thursday’s forecast continues with a 40 percent chance of thunderstorms and a high of 86. Friday’s forecast is partly sunny skies and a high of 86.